Please join us for drinks to celebrate the women of WPA (Women's Prison Association) this Galentine’s Day, February 13th, 2019. GAL will be helping raise money via a prize wheel and collecting items off this Amazon Wish List for the justice-involved women in the WPA. We will all be collecting unused, new items at the event such as bras, underwear, socks, pjs, slippers, robes, towels, beauty products, tampons, and other items for women in their programs. If you don’t live in NYC please consider donating or gifting from the Amazon Wishlist mentioned above! Join GAL for our monthly book club meet-up! This month we will be discussing the dynamics within friendship and music in The Ensemble by Aja Gabel. GAL is thrilled to host author Aja as our guest speaker. GAL CD Eliza Wexelman will be in conversation with Aja at Deep End Club. Before the conversation we will have a 30 minute live performance by Jonathan Tang, a local violinist and group. Bring your thoughts, questions, and conversation! We suggest reading the book, but even if you haven't, please join us and feel free to add to the conversation. 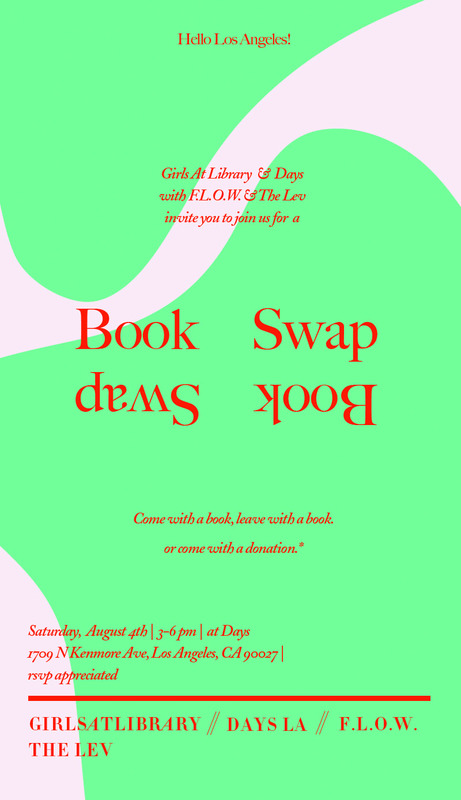 GAL will be partnering with Catbird to bring you the NYC edition of our Book Swap! There will be Gift Bags, librations, and more! So come with a book, leave with a book and some. GAL will be partnering with Days for a Celebration of Women and Literature with Feminist Library on Wheels (F.L.O.W. ), and The Lev. Join us on August 4th to exchange books that are written by women or feature female protagonists. Come for the books but stay for the interesting people and open dialogue. All are welcome! Your recommendations may be featured on GAL! We are also accepting overflow book donations for F.L.O.W., and The Lev founder Miram Chan will be present with a selection of favorite books for sale! GAL presents and evening with Leah Dieterich in conversation with Ann Friedman at the Ace Hotel DTLA. Join us for a discussion centered around the female experience, sexuality, gender, identity, and marriage to celebrate the launch of Leah's memoir, Vanishing Twins: A Marriage. Books will be for sale at the event from The Lev or for purchase with ticket to guarantee a copy for pick up at the event. Join GAL for our monthly book club meet-up! This time, we'll be in NYC discussing July's book- Back Talk by Danielle Lazarin. GAL is thrilled to host author Danielle as our guest speaker. GAL EIC Payton Turner will be hosting the discussion and Q&A with Danielle at Haven's Kitchen. Bring your thoughts, questions, and conversation! We suggest reading the book, but even if you haven't, please join us and feel free to add to the conversation. Please join GAL in conversation with poet and memoirist Yrsa Daley-Ward about her powerful new memoir THE TERRIBLE. Yrsa’s book will be available for purchase by The Lev at the event, but we suggest you read it beforehand to join the conversation. The talk begins promptly at 7:15pm with an audience Q&A at the very end, followed by a book signing. Copies of THE TERRIBLE and bone will be for sale at the event but to guarantee a copy, pre-order here through The Lev. This is the first of GAL’s monthly book club series. Join us next month in New York, or (always) via our Facebook group and Instagram stream. GAL & The Lev bring together authors Zinzi Clemmons & Shauna Barbosa for a conversation to celebrate the release of Zinzi's novel What We Lose in paperback. Partnering with Days and Lisa Cole, we are back with the next installment of the popular Food to Fiction dinner! This version is based around the question—What is the LA story? We explore this through an evening of vegan food woven around the women whose stories shaped Los Angeles. From Helen Hunt Jackson to Charlotta Bass, Joan Didion to Janet Finch, Lisa See to Vanessa Place, we wander though the fictions of this place. One ticket includes a 3 course meal, cocktail by @folosophy, wine, and an interactive evening of fun!